A useful feature in the Wolf Designer is the categorisation of the elements of your web application. By default, the "General" Category is available to the Wolf application designer. However, in addition to the "General" category you may create custom categories for grouping of related elements, logical seperation of different elements as well as for providing visual seperation of these elements in your end application. - an Entity "Other Staff" to hold the details about other staff in the college such as lab attendants, etc. 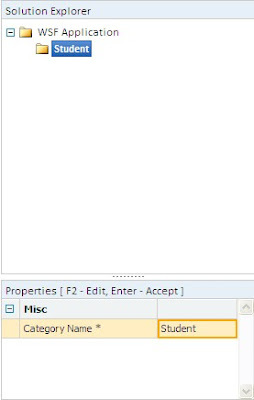 Category "Student": which will contain the Entities "Graduate Student" & "Post Graduate Student"
Category "Faculty": which will contain the Entities "Professor" & "Other Staff"
The Entity "Leave Details" may optionally be assigned to a custom Category or to the "General" category. Lets take a look at how you can create Categories for your Wolf application. To create a new Category, right click on the Application name --> Select "New" --> "New Category". Assign an appropriate name to the new Category (Example- Student) and Publish your changes to start using this Category in your application. Once you have created the Categories you can start assigning the Entities and their related Navigation Items to their appropriate Category. 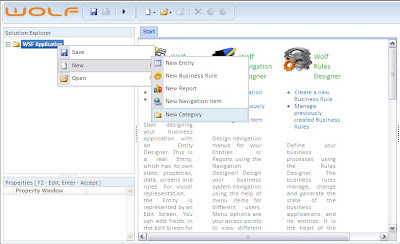 Tip - Create a Category "Reports" and assign all the Navigation Menus linked to your application's reports to the "Reports" Category. An important point to remember is that the Category "Dashboard" is assigned to a Navigation item as a rule while creating Dashboard Items. More on this in a later post.